Visiting Research Fellow and Lecturer in the School of Culture, History and Language, the College of Asia and the Pacific at ANU, Dr Adam Broinowski, traces how this developed in various stages of US empire. He suggests that by reducing demand and consumption of oil, we may also reduce one the major sources of military conflict. Broinowski also argues that by reducing the centrality of oil in our global economy and its accompanying securitization, we can address the problems affecting billions of people on the planet posed by global warming. At this moment of shifting world order, as the atomic clock returns to two minutes to midnight (the first time since 1953), the nuclear superpowers have withdrawn from a key nuclear arms treaty and the United States has committed to a $US1.5 trillion upgrade to its nuclear arsenal. One can be forgiven for a sense of déja vu. Unlike the 1950s, however, we’re faced with the risk of full-scale nuclear war, and mass extinctions resulting from anthropogenic climate change. In this noxious combination of ever-increasing militarism and biospheric disruption, it’s imperative that we recognise the factors that have led us to this situation so that we can respond meaningfully, rather than simply react. Significantly, oil has played a central role in the US’s reshaping of the world order since the turn of the 20th century. When US leaders lay claim to ‘exceptionalism’ and “manifest destiny”, and position America as a beacon of freedom and democracy, they have at the same time asserted their military might to enable access to zones and supply corridors essential for the flow of vital resources, products, labour and market access. Come and join the Ngara throng at the Court House pub for another great night out among fellow travellers on the juggernaut of progressive politics!! Arrive early - between 5:30- 6:00pm - if you want to secure a seat, and order your favourite food and beverage! Dinner is available from 5:00pm. Vegetarian, vegan and gluten-free options are available. 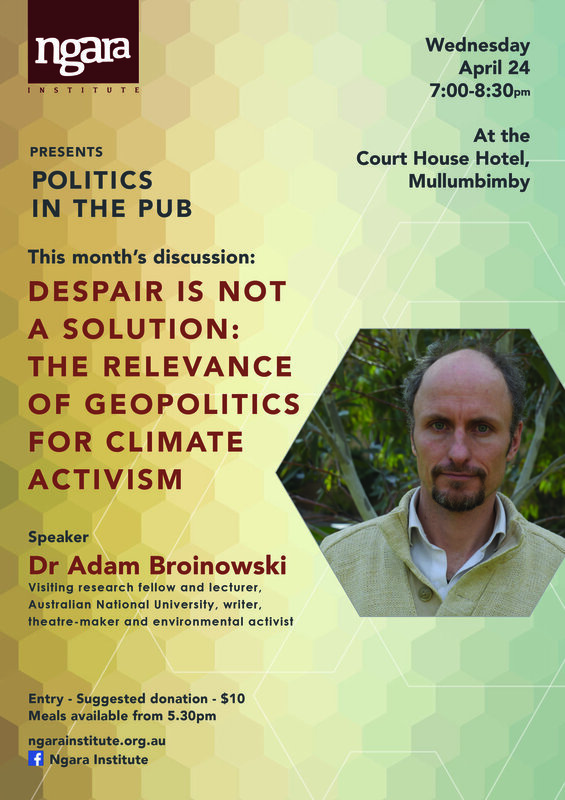 Politics in the Pub is a Ngara Institute initiative organised by local people for a local, national and international audience.